It might have been quite a job for editor Dan Shideler to select the chapters for Gun Digest Book of Classic Combat Handguns, but it was also a labor of love. Dan, who passed away April 3, 2011, probably savored every moment he spent combing through his collection of Gun Digest annuals dating all the way back to the inaugural 1944 edition. According to Dan, he was raised on Gun Digest, and being editor of the book was a dream come true. The literature Dan chose to represent classic combat handguns is testament to great guns and great writers. The content in this book spans 1949 to 1999, and topics range from the obvious (Model 1911, Luger, Glock) to instructional (“Rating Handgun Power”) to historical (“Early Rivals of the 1911”) to just plain old food for thought (“Too Many 45s?”). Writers represented in this volume include the greats: Jeff Cooper, Frank Barnes, John Malloy, Larry Sterett and many more. Once available only to those few collectors who owned a complete set of Gun Digest, Gun Digest Book of Classic Combat Handguns represents the cream of the crop from the most enduring gun annual of all time. We hope you enjoy reading this compilation as much as Dan enjoyed putting it together. 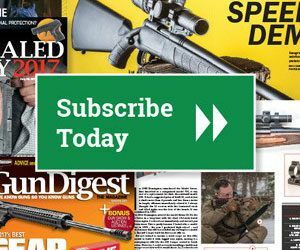 To enter a random drawing to win a copy of Gun Digest Book of Classic Combat Handguns, post a comment below telling us about your favorite combat/tactical handgun. Or, just say you like to win a copy of the book, and you’re in. Entries will be accepted until midnight Sunday (Sep. 18), and we’ll announce the winner on Monday (Sep. 19). Entries accepted until 11:59 pm Central Time Sunday, Sep. 18, 2011. Winner will be selected at random and announced Monday, Sep. 19, 2011. Without a doubt, it’s the 1911. I would love to win a copy of the book. I’d like to win the book. My favorite is my Sig P226 9mm. we don’t have much ready access to quality firearm reading materials like this where i come from. so, given the chance to own one, no matter how remote, i have to jump in. though it is not the gun i carry daily owing to its size, weight and my body structure, my favorite combat/tactical firearm will forever be the 1911.
the one i have i built from a Colt Gold Cup frame, a Caspian slide and a Nowlin barrel. born, raised and continuing to live in the philippines, i’m blessed to have access to gunsmiths who’ve made entire careers on the 1911; they help me keep this firearm in tip-top shape. Sounds like another must read. Since I don’t have any combat training, my chose of a weapon would be minimal. I do have a 45acp model 1911 Kimber that I would give a nod to however. This book would be a great addition to the bookshelve. I would like to win!!!! My favorite would have to be the Smith and Wesson M&P .45, as it is the only one I have. It fits my hand the best of all I I have tried, with the exception of the Sig 357 (which I could not afford). Favorite-Colt Combat Commander in 45 cap. My new favorite is my Walther P5. I love shooting it and looking at it ain’t too bad, either. the Steyr M9-A1 is a great defensive handgun (better with replacement night-sights)! For sentimental reasons I love my Mauser 1910-34 auto-loading pistol my grandfather brought back from Germany after WWII (he was a POW and traded a guard two packs of cigarettes for it when they heard the Russians were coming). But recently I got to shoot a CZ 75 and fell in love. What a great pistol! I love my Glock. My Glock 19 Gen 3 is my favorite gun I own. After thousands of rounds, I’ve never had a malfunction. My Browning Hi-Power in .40 S&W is the perfect combat gun for me. I’ve never found another handgun that fits my hand as well and it has the perfect balance between stopping power and recoil. It’s also been dead reliable. I’m a fan of Wilson-Combat guns. In particular the CQB Light-Rail Lightweight Professional. Fantastic workmanship on this hand gun. In fact all their weapons are of superior quality and design. My favorite would be the Auto Ordinance 1911 I got as part of aulti-gun purchase. Assembled from a 1911 “kit” it looked pretty rag-assed and bottom of the barrel when I got it. With the help of a GREAT gunsmith and parts from Novak, Eagle Grips, Wilson Combat, Briley, etc. it is now the best looking and shooting handgun I own. My friend with a Gold Cup can’t believe my trigger pull is better than his Colt. The greatest combat pistol would have to be the 1911,but the Colt SAA would have to be in there. My favorite Classic Combat Handguns. It should be a great read! I’m a CZ fan. Though I think of them more in a police role than true military. The little CZ83 is an outstanding performer despite it’s vintage. I think the Walther P38 in 9MM is one of the best Military Handguns. IMHO, the most important characteristic for a combat weapon is that it works all the time, anywhere. The second is that the stopping power is adequate. The third is that it be easily shootable. The 1911 is excellent at two of these, but the Glock G30 (or G21) is easier to shoot and is spectacularly reliable. Sig P226. And I would love to win a copy of the book! My favorate combat/tactical handgun is a revolver such as a S&W 627 .357 or 629 .44 mag. Just point and press, no levers, dangers, or anything else to think about other than the problem. The colt 45 auto gets my vote. Early on in the “plastic gun” era, I was unimpressed with the idea of a firearm with plastic parts. I’d grown up in a time when “plastic” was synonymous with “cheap” so making a mental shift to this connection between “plastic” and “firearms” was quite the hurdle. Nevertheless, I had an opportunity to fire a Glock and took it. It’s lines were anything but graceful, it was boxey and clunky looking, but when I took hold of it and started firing off .45 ACP rounds and felt it cycle, I was hooked. The 1911. Would really enjoy this book. Editor Dan will be missed. I still vote for the 1911; the only pistol whose trigger works with you for either target or social work. Nothing is as easy to control accurately AND rapidly, too. Well, I’d love to win the book, but also, my favorite combat handgun has always been the classic 1911. I carried one in the Navy and, even though it was a rattletrap and had been rebuilt who knows how many times, it was accurate and a natural pointer. I’ve been out of the Navy for a long time (since before the Beretta conversion), but I still love the 1911 – I’ve got three of ’em today! Would like to add this book to my collection! I have always been a M1911A1 man but my father had a P-38 when I was a child. It looked classy as hell and It sticks in my mind. I just wish it was available in 45ACP. Wow this is a hard one there are many to choose from: mauser C96(broom handle), luger, 1911, glock, beretta, walther are just a few. The mauser although ahead of its time used an internal magazine which knocks it off the list, the luger although at one time the US had this in line to be the next combat pistol (luger made two in 45 and only one is still around) the jamming problems failure to feed kicks it off the list. Beretta particularly the 92f series had it’s problems if your assailant was at arms length they could disassemble the pistol leaving you pointing a frame at them(they quickly fixed the problem) but the 9mm round is what kicks it off the list for me same with the wathler PP and PPk models ammo is just too light. On to glock I really don’t have much to discredit the glock just that the plastic sights will get warn down and when you align the front post with the back the bottom of the front dot is slightly hidden which will cause some to shoot high. My top combat pistol is John Moses Browning’s very own 1911. The design started with the FN M1900 the military wanted more stopping power than the 32 acp after soldier’s discredited a smaller round and the revolver in the 1890 war in the Philippians It has a 100 year history with very little done to it. It has more stopping power than a M1 carbine and 9mm pistols it’s reliable and when there is no more ammo a pistol whip with that will hurt more than with plastic. Some will also compare the amount of ammo carried between the 9mm round and the 45 acp saying that your better off with more rounds. With more rounds in the clip you are more likely to spray and pray vs well placed shots knowing that X amount of rounds fired does not equal Y number of assailants down we learned this the hard way in Vietnam. That is why the 1911 pistol to me is the best combat pistol. I would really love to win the book! !